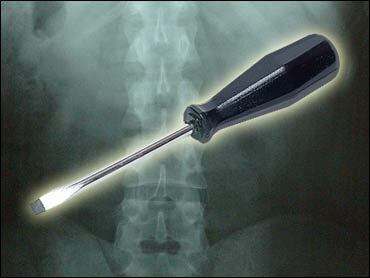 A surgeon accused of inserting a piece of a screwdriver into a patient's spine, instead of a titanium rod, has been sued for malpractice. Rosalinda Iturralde, the sister of the patient who died last month, filed suit against Dr. Robert Ricketson. It was at least the eighth time Ricketson has been sued for malpractice, attorneys said. According to the suit, filed Monday, when Arturo Iturralde underwent spine surgery in 2001, Ricketson had already had his medical license suspended in Oklahoma and revoked in Texas. His license was under review in Hawaii. After the surgery began, the lawsuit claims, the doctor realized the rod he planned to insert was missing. The plaintiff says Ricketson used a hacksaw to cut a stainless steel screwdriver, then tightened it into place in the patient's spine. Days later, the screwdriver snapped in half and Iturralde again underwent surgery for its removal. A nurse who later found it in the trash notified the family, attorneys said. Iturralde underwent more surgeries, but eventually become a paraplegic. Rosalinda Iturralde contends her brother died June 18 at age 76 because of complications from the surgery. Efforts to find an address or phone number for Ricketson, 48, were unsuccessful. He applied for a medical license in Kansas last year, but later withdrew the application.